I’ve been thinking that it would be super fun to run a tube full from a .357 lever to start a high intensity round. I just wasn’t sure if there would be positive detonation. Rolf was using his .357, should ask him what he was using. But he had to be at entertainingly close distances to get detonation. 125 gr golden saber over 16.5 gr 2400, 6″ barrel. About 1450 fps IIRC. About 2150 out of a 18″ barrel on a lever-action. Range likely around 10 yards, but I’m bad at judging distances. Can you run wad cutters through your lever action? 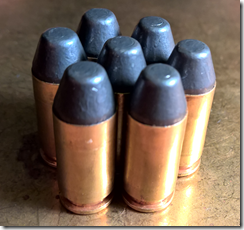 And what muzzle velocity do you get with the ammo you want to use? Not sure. I’m looking for an excuse to buy one! I mean reason. Reason is what I meant. Discovering a pistol load handy for range cleanup is nifty, but…it would seem a setup like Rolf’s would, in the long run, be more reliable and easier, if not quite so handy as a hip-mounted tool. 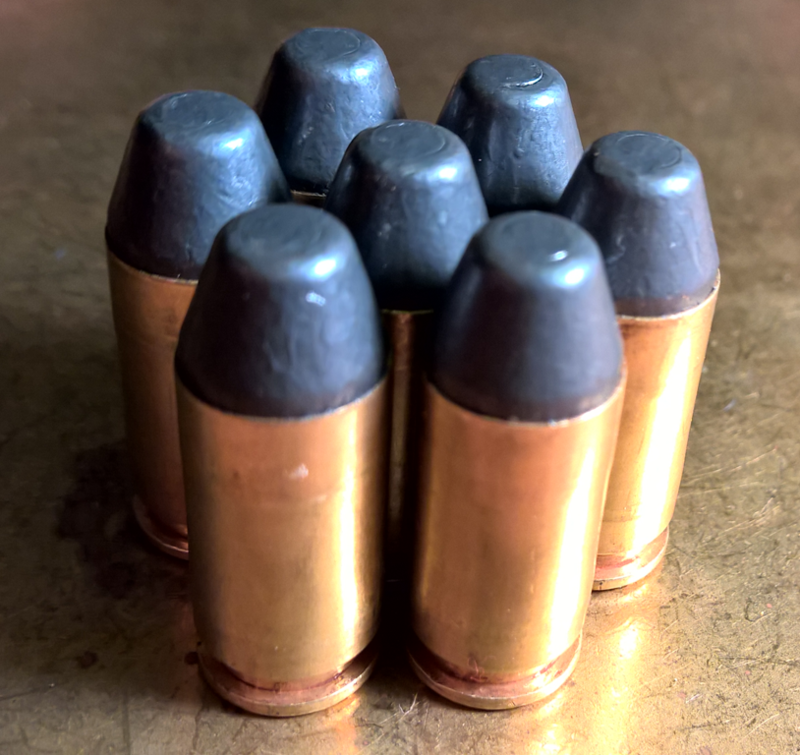 When I lived in FL I bought 140 grain truncated cone hard cast bullets from a local casting outfit, which made them for Cowboy Action users (I used them both for very light recoiling downloaded ammo for newbie class students who showed up with an airweight .38, and as projectiles in competition loads for ICORE, using 38 Short Colt brass). I’d think a lever 357, equipped with a sling, would be a very useful range cleanup tool. A rifle would allow cleanup from greater distance, the sight radius greater accuracy, the velocity increase greater cleanup reliability, and sufficient ammo capacity to be useful. True, not as handy as 2 lbs on the hip, but I’d venture that if such a tool was made available, you might find people willing to pay for the privilege of performing cleanup. One day I will need to tell the story about how I was asked to think about how to create the letter “E” on the moon large enough to be seen by the naked eye from earth. As in “The man who sold the moon”? No. This guy wanted to establish a moon base as a stepping stone to him being the first man to set foot on Mars. Having his initial on the moon was his means of reminding others (a couple people in particular) that he was more successful than them. Be easier and cheaper, but less exciting, to use a lot of paint.